As seen from around the world, the waxing gibbous moon shines in front of the constellation Taurus the Bull tonight. Despite the moonlit glare, you may see the Bull’s two brightest stars: Aldebaran and Elnath. Aldebaran, the star depicting the Bull’s eye, is Taurus’ brightest star. Elnath, the constellation’s second brightest star, marks the tip of the Bull’s northern horn. Our sky chart is designed for mid-northern North American latitudes. 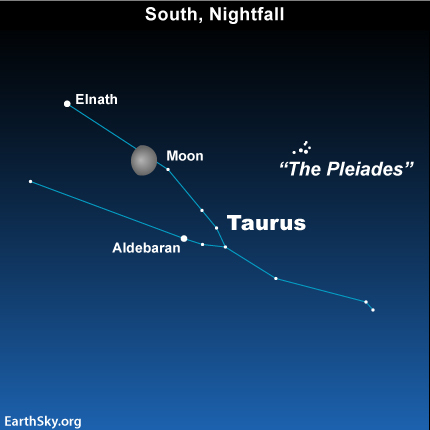 The sky will look similar from mid-northern latitudes in Europe and Asia, except that the moon will be farther west in front of Taurus, closer to the star Aldebaran. The rather faint star Zeta Tauri pinpoints the tip of the Bull’s southern horn, but the glary moon will make this star difficult if not impossible to see tonight. When the moon departs from the evening sky in a few more weeks, you should have no trouble seeing Zeta Tauri from a dark country sky. The last week in February, in fact, should be ideal for viewing Taurus in all his starlit glory. On a dark night, deep-sky aficionados enjoy looking at the Crab Nebula (Messier 1) through a telescope. 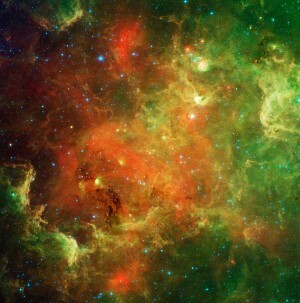 The Crab Nebula is found between the tips of the Bull’s horns, a tiny hop from the star Zeta Tauri. Astronomers believe the Crab Nebula is the remnant of a star that exploded as a supernova in 1054 A.D. This supernova was so bright that it was seen with the unaided eye in the daytime for 23 days and at nighttime for 653 days. Tonight, on Wednesday, February 13, look for the moon between Elnath and Aldebaran, then for the Crab Nebula with a telescope on a dark, moonless night! Site contents copyright © 2019 Recorder Online	except as noted. All rights reserved. | 88 queries in 2.070 seconds.